I decided to take this workshop an hour before it was about to begin. Kind of in the "spur of the moment". Sean Cheetham is an artist I've admired for a while even though his style is quite different to mine. He paints in a realistic fashion with a very high emphasis on the drawing. His main influences are Michael Hussar and Antonio Lopez among living artists and anywhere from Holbein, Alma-Tadema, Waterhouse, Dagnan-Bouvert, etc... among old masters. During the first day, he decided to paint a portrait of a sculptor friend in the manner that he usually approaches most of his "finished" work. He brought several non-glossy prints and a support which he had previously primed and already had the drawing of the subject. His palette is not unusual but there a couple of more "acid" colors that seem to go well with his subject matter and lighting of choice. and a warm Grey from Rembrandt to neutralize. He goes over the whole painting first with a light wash of acrylic. Very light so as not to create a layer of plastic between the oil and the support. He usually starts laying the darks first, very precisely and deliberately. He uses cheap University W&N nylon brushes of sizes 4 to 6 which tend not to last but fare well in the level of precision he requires. No big brushes here. He works with a tremendous amount of detail and focus. No rushing h ere. That's how you go quickly actually, by not making mistakes or adding random garbage. Here is a picture of the painting after all the darks have been placed. And here is a picture of the original print. 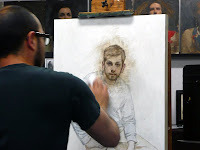 Sean says he prefers to work directly from the monitor to judge color and is not against any technique to accomplish accuracy. Of course, he draws *really* well. It is worth observing how organized he is in his palette construction. During the dark building process he mixes enough of a pool of dark. he also mixes the tone of the fluorescent lighting with manganese blue for posterior use. Like any good painter, his colors will remain almost miraculously clean throughout. thank you for sharing. i like his work too. Would you recommend taking his workshop? I did not attend his LAAFA class but I definitely recommend his class. Especially if you are in an advanced stage of your work. Not for beginners.